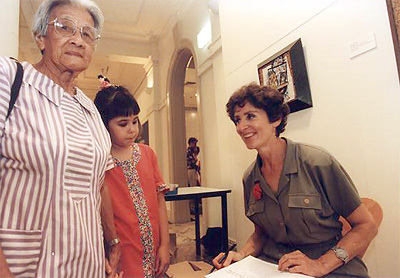 Ida Sou San, Kate Campbell and Diana Giese at the launch of Astronauts, Lost Souls and Dragons at the Cairns Regional Gallery. The book grew from my continuing oral history project on Chinese Australians for the National Library. The voices of oral history, re-imagining, re-creating other times and places, structure the work. The text produced from them is open to many readings, multiple interpretations, all of them provisional. Such readings may involve a decentring of conventional meaning. These people are speaking about a deeply felt sense of integrity and self-respect, but from the edge of consciousness of what has become accepted as "Australian". They both make and remake themselves in these histories, speaking powerfully from within their sense of what is true. They seek validation of their memories and stories by the very telling of them. Using oral history as snapshot, sound bite, anecdote and case study, I slice into Chinese Australian experiences at several thematic pulse points. From the vast body of original recorded material, dozens of hours of tape, I have extracted and shaped contributions. I explore different ways of presenting the raw material of the transcript. I have sometimes used large extracts, both questions and answers, to suggest the shape and feel of particular conversations. The interchange between two or more voices can energise, add a special dynamic. It also shows how different interviews can be. Informants’ styles are distinctive, from rapid-fire exchanges to slow and thoughtful discussions. They can range from vivid story-paragraphs to great looping sweeps of words. Having chosen my informants, recorded and transcribed their words, I then stand back and listen. My voice in the book also enquires, prompts, responds, encourages. As the work developed, I elicited amplification from some informants, by phone, fax or letter. As an active "character" in the work, and also the silent maker of its narrative thread, I sometimes step forward to question, validate or dispute my earlier interviewer’s voice. 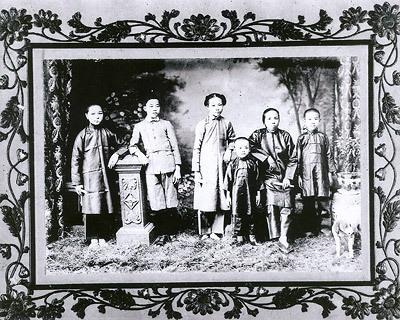 George Tung Yep’s mother (far left) and his father’s first wife and her daughters (right). 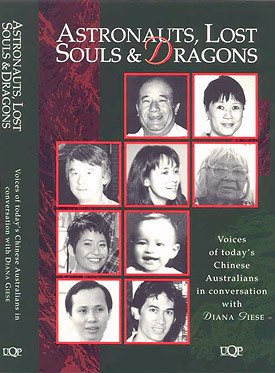 To see the full list of Chinese Australians interviewed, view Community history. To read the book, go to http://trove.nla.gov.au/version/45531920and find a list of the many libraries which hold copies.